Iconic might be one of those words we want to retire for a while. If I heard it once yesterday I heard it a thousand times. The Cathedral of Notre Dame was iconic and that cannot be denied. It danced in the imagination when we read Les Miserables or the Hunchback of Notre Dame. Napoleon was crowned there in 1804, and Henry VI of England was crowned there in 1431. It held the crown of thorns that was placed on Christ’s head before His crucifixion. When I think of it I have a mental labyrinth that I follow like this. Notre Dame is famous for it’s bells that were all named. 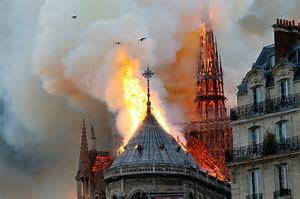 The bell ringer at Notre Dame was a hunchback who had been dumped off at the church as a new born infant. Quasimodo rang the bells at Notre Dame which was built over hundreds of years to show the glory of God and proclaim His praises. Here is the introit for the Sunday after Easter and you can sing it to the points found in the Lutheran Service book. if indeed you have tasted that the | Lord is good. make known his deeds among the | peoples! tell of all his | wondrous works! let the hearts of those who seek the | LORD rejoice! seek his presence con- | tinually!